POS KAD HARI MALAYSIA UNTUK PM. The Malaysia Centre for Public Opinion is organizing a month-long campaign to encourage Malaysians to send postcards to their Prime Minister. It's your postcard, so you may write anything, but what Macpo is really hoping to get is you wish list of things you want the PM to do to improve your lot and place the nation in better stead. You have until 15/10/2010 to send your post card. The Malay Mail, that paper that cares, will publish selected postcards. To send your postcard NOW, click H E R E.
* Could not blog earlier. The whole day was spent looking for a charger for my Ferrari. Finally found it at Low Yatt, which was just buzzing with people looking for the latest computers, mobile phones, PC games, or laptop chargers. Ader time ker dia nak baca kalo 10j rakyat hantaq..
Macam nak buat free survey ajer ni..
MAHAL oooo opinion RAKYAT, Najib should pay for our thoughts!! groups by decomposing the base-income equations for Malays and Indians. is clear from the above analyses that only a very small portion of the income differences between Chinese and the other two ethnic groups can be explained by educational differences. Dear Sir Blogmaster, my sincere apologies are due to Lee Kuan Yewkelstein, Lee Hsien Loonginsky, Chua Soi Lekmotif, Lim Kit Siangberg, Lim Guan Engashnikov, Anwar Avrahimof, Nurul Izzahbegova, Zaid Avrahamizick, Nazri Azizgotsky, Nazir Razakistein. Wan Azizahamstein and all the great men and women (excluding that prat Ibrahim Ali) for having spoken disparagingly about meritocracy, level playing fields and equal opportunities. Merci' on my poor humble soul, my dear Sirs and ladies. I beg for a pour de homme of kindness. What a way to measure popularity. The number of post card with positve and negative message will provide the PM an edge to analysts his leadership quality. But for me , NA.. I wont waste a penny for that! p/s You dont trust Merdeka polls anymore is it? PM still rely on APCO (foreigners) for his 1M, do we really gain the true MERDEKA SPIRIT when now we are still relying on APCO (Foreigner) to unite us. WHt a crap!. After more than 50 years of Independence, bribery and lackadaisical attitude is still deeply entrenched in our society. Worse still, nothing will ever happen and no action will be taken to the perpetrators because of their connection with powers that be or by simply having money. We all should learn from the event of the last two weeks, if only, we could shake off our lackadaisical attitude, if only we check and investigate thoroughly all the reports lodged against the killers, Datuk Soosilawati might still be with us. The other story of a philanthropist who clearly tried to bribe HRM Sultan of Johor in broad daylight or malam raya(as it were). He could call it a kind gesture but to most it is still a bribe. The philanthropist will go scot free because of his connections with the powers that-be or simply because of his wealth... Perhaps even simply because he have done many good deeds.... we the people will turn a blind eye. Or, we could, in the spirit of 1 Malaysia, on this auspicious day, change our attitude to become a better Malaysian, a greater Malaysian, an equal Malaysian, a free Malaysian, a Malaysia free of bribery and no longer lackadaisical, a Malaysia of the better world. 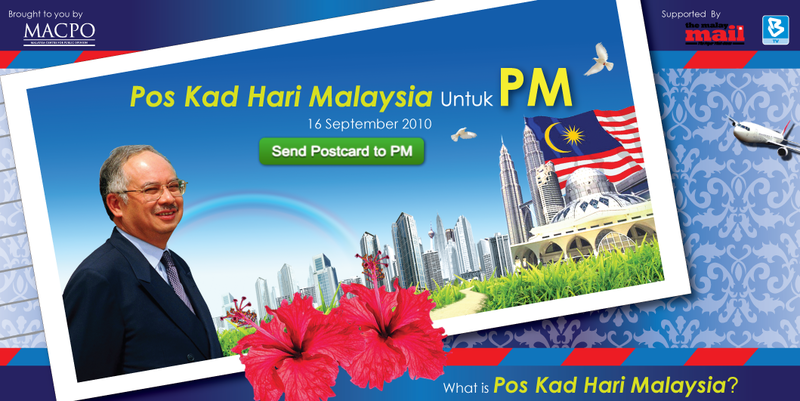 I would not mind sending a postcard but being a Malay yang bersopan santun, I'd rather not. But I think he will get tons of postcards from my Indian and Chinese friends though. Must atleast be one from LKY. Namewee. Me? I am yet to find something nice to say. I am desperate to be grateful to him actually. I learnt from MR PM. I will play safe and not say or do anything. anu cdg depa letok jawatan, suruh Tan Sri Muhyiddin aje yg gante.